After hearing lots of awesome things about the Routeburn Track, I finally booked the hut. It can be booked here. The Routeburn track is one of the Top 10 most beautiful hikes in the world. At 32 km long, people normally do it over two or three days, although I hear some super fit people run the whole track in one day…not for me though. Because of its popularity, the huts are normally booked out way in advance. So get in quickly, guys. I got up nice and early on the day. 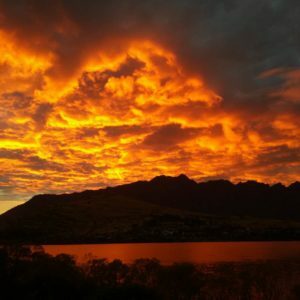 Saw a beautiful sunrise in Queenstown, the colours are unlike anything I’ve seen before. The sunrises in Queenstown are pretty spectacular, something everyone should see when they’re visiting Queenstown. My friend Alisha and I headed to Info & Track at 37 Shotover St to catch the 8am bus to the Routeburn Shelter. The views along Lake Wakatipu from Queenstown to Glenorchy are incredible. No wonder it’s one of the most beautiful drives in the world. So if you can, keep your eyes open and stay awake! The views are not to be missed! We had a 30 minute stop in Glenorchy, which is a charming little town perched at the head of the lake, with a population of about 300. I had a coffee at the café called Glenorchy Post. If you have time you can walk through town or down to the lake. It’s easy to get distracted by the views, so make sure you get back to the bus on time. We arrive at the start of the track around 9:45am and set off on the hike. The first section, from Routeburn Shelter to Routeburn Flats hut, is pretty easy going. The views are spectacular, with streams bubbling away, trees dripping with moisture, mini-waterfalls spilling on to the track. The lack of blue sky and the dense low lying cloud is far from making the hike miserable though. It’s creating such a mystical atmosphere, even as we leave Routeburn Flats and the track starts to climb, the forest and the occasional spray from the waterfalls is a welcome distraction from my pounding chest and my heavy backpack. After three hours walking through this wonderland, we make it to the second hut, Routeburn Falls Hut. The waterfalls there are incredible. Looking back from where we have walked, we can see the valley below and how much elevation we have gained. All the hard work and sweat has paid off. We soak up the views and catch our breath…there is still 10km to go. A bite to eat, some water and we set off again for Lake Mackenzie Hut, our hut for the night. From Routeburn Falls hut to Harris Saddle, it feels like we are walking through another world, the vegetation is unlike anything I’ve ever seen before. Beautiful Lake Harris is a perfect peaceful body of water, nestled amongst the mountains. On a sunny, clear day, you might be tempted to go for a swim! We stop for lunch at Harris Saddle, the highest point on the track, and look back from where we came. As we leave Mount Aspiring National Park behind and enter Fiordland National Park, it starts to rain. The Routeburn runs through the Hollyford Valley, which has an average rainfall of four metres a year…we knew we weren’t going to be staying dry! It is highly recommended to check the conditions of the track through the DOC (Department of Conservation) websites and the offices in Queenstown before going. You should always expect rain and pack appropriate gear, you don’t want to be caught out. On the approach to Lake Mackenzie hut, the vegetation changes again. It’s quite different to the other side of Harris Saddle. We finally reach our home for the night, Lake Mackenzie hut, around 4:30pm. After dropping our pack off in the hut, we headed to the kitchen to start cooking some food for dinner. The huts along the track are all very well equipped and maintained throughout the walking season, with ample cooking facilities and beds to lay your weary head after a long days hike. There is gas, running water and even a fire place for those colder evenings. During dinner, the DOC warden came and gave us some information about the Routeburn Track and Fiordland National park. We learned that the Routeburn Track is the only track in New Zealand that goes through two National parks, Mt Aspiring National Park and Fiordland National Park . This explains why the vegetation is so different before and after Harris Saddle. Lake Mackenzie hut sleeps up to 50 people, and can get busy in the peak summer months. It’s a pretty cosy set up and the beds are right next to each other. With a full hut, you’re going to get a lot of snoring and noise during the night, so it is definitely recommended you take ear plugs with you. After a lovely dinner, we headed to bed, it had been very a long day. We got up early again the second morning. The rain had stopped so we explored the area around Lake Mackenzie Hut before breakfast. We set off on the track again around 9am. We only had 12km to go, so we took it easy. As we had a bit more time this morning to get to the end of the track, we stopped to take lots of pictures. As predicted, the rain didn’t hold off for long, but we were treated to a beautiful rainbow. Always a wonderful sight when it’s raining. Towards the end of the track there is the option to do a side track, but we decided not to do the side track because we didn’t want to miss our bus at 3pm. It turned out we were early, so we had to wait for a little while. It’s definitely important to leave yourself enough time to get to the bus on time. The buses have other exhausted hikers on board finishing other tracks and have to keep to timetables, so if you aren’t there on time…you might be left behind and have to wait for the next one or the next day! We happily hopped on the bus and headed for home. We were both exhausted and slept most of the way back to Queenstown. If you need to get dropped off before town, the drivers are very friendly and are willing to drop you at a convenient location on the route home. Either near the airport or on the Frankton Road. Have a chat with the driver when you are near Queenstown and let them know. I highly recommend ordering your favourite burger from Fergburger before you get to Queenstown, so it is ready for pick up when you get there. Anyone would deserve it after a 32km hike! I definitely feel like I earned it.